The equity markets in Europe and in the U.S. are robust. The S&P 500 is up 9.49% year-to-date, the NASDAQ index is up 11.75% YTD and the Dow Jones is up 8.99% YTD. Similarly, the Euro Stoxx 600, DAX, CAC 40 and IBEX are also up 7.74%, 7.23%, 7.21% and 5.10% YTD respectively. So what is behind this rally? There is no doubt that the European central bank is more hawkish than the Federal Reserve and the reason that I am saying this is because the ECB is in denial of the fact that there is any meaningful weakness in the economy over in the Eurozone. The president of the European central bank, Mario Draghi, maintains his view that the sailing path for the monetary policy is in the correct direction and there is no significant reason why the bank should be changing its course. The Fed also had the same message last year, and this resulted in the weakness in the economic data. 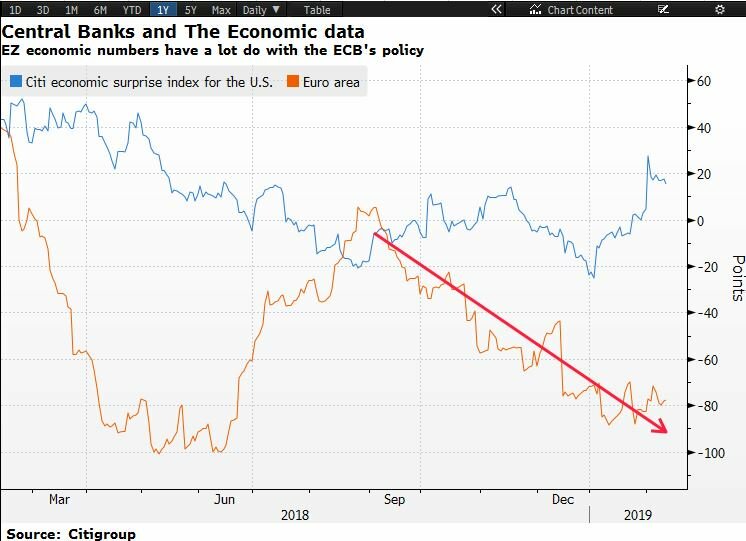 The below chart shows the Citi economic surprise indices for the Eurozone and the US. One thing is evidently clear, the Eurozone’s economic data has started to roll over, and the chief reason for this is: the ECB has become a lot more hawkish than the Fed. Jerome Powell, the Fed Chairman, had a similar mind frame, but recently, he has adopted a different tone in relation to the monetary policy. One can see from the chart below that the economic data has started to perform well as a result of this. Sadly, for the eurozone economic data, we have not seen any change in the current trend. Hence, I do believe that the current weakness in the economic numbers will make the ECB rekindle its monetary policy message in the near future. The equity markets (usually) accurately factor in the weakness of the economic numbers. However, this argument doesn’t hold too much strength if we look at the below chart. 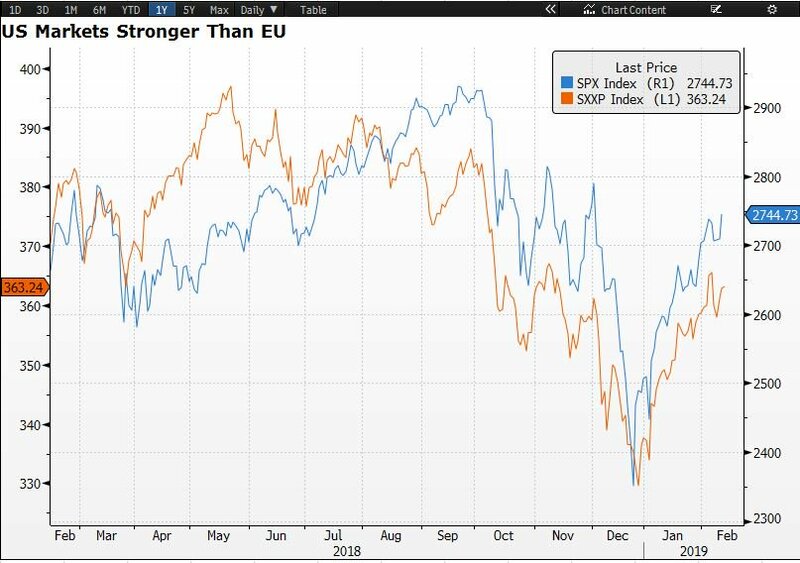 The chart shows the comparison of the S&P500 index and the Euro Stoxx 600; one can see that both indices are moving in the same direction and there is a very strong correlation. This leads me to think why the ECB isn’t that concerned about the economic data; we have not seen any meltdown in the European markets. If we focus purely on the fundamentals, the U.S. markets are a lot stronger because they have the support of the Fed and economic data. Unfortunately, one cannot say the same for the European markets: the economic data is feeble and the ECB is looking for an opportunity to start the interest rate hike cycle. Time over time, we have seen investors becoming nervous when the dollar index starts to rise. Generally speaking, higher dollar eats the US corporate profit because a higher dollar makes the export less attractive for the country. However, one strong trend that I am witnessing for this year is that the equity markets moving higher while the dollar index maintaining its strength. To put things in perspective, the dollar index is experiencing its eight-day rally—its longest rally going all the way back to 2016. The dollar index is on the run since the Federal Reserve Chairman, Jerome Powell said that the bank “will be patient”; this is a dovish tone and it should move bulls away. However, we have not seen this. The concern is if the US investors are no longer worried about the dollar strength or the alternative is that this trade is not going to last longer. 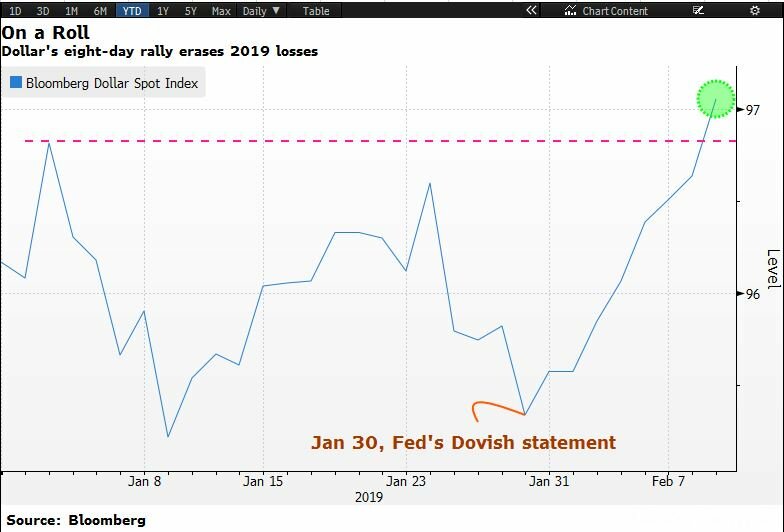 I really do not see a compelling reason why the dollar should be moving higher when the Fed is dovish unless of course, the market participants do not believe that the Fed is going to remain dovish and they will be forced to adopt the hawkish stance. 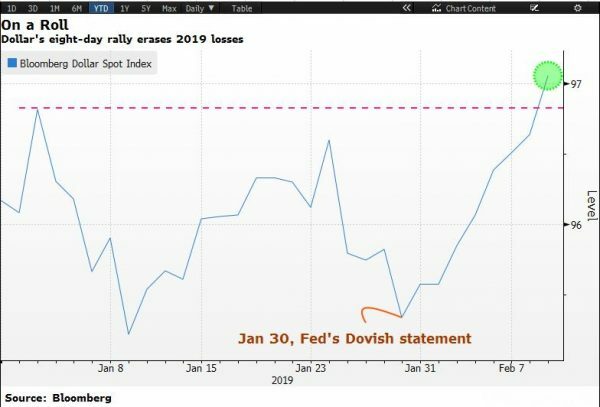 To conclude, I believe there is strong evidence that the Fed’s recent dovish stance has helped the U.S. economic data and this also provided the helping hand for the U.S. equity markets. However, I am concerned about the rise in the dollar index and the U.S. equity markets. Finally, the European markets may see some retracement if the economic data doesn’t support it.